Well hello! I thought you might be interested. I'm not talking Eggnog flavored scones either. This is the real deal. Made with actual Eggnog. Two warnings before you get started. 2 - Try your hardest to stir gently and don't add extra flour. Otherwise they will get tough, and no one wants a scone that they have to rip at with their teeth. You'll probably have to use your freezer before you can bake these suckers. 2) Add eggnog and rum, and using a spatula, gently fold until ingredients are just combined. 3) Transfer dough to a baking sheet lined with parchment, and pat into a circle about 1 inch thick (or slightly less). Cut all the way through in desired shapes/amounts, and freeze for 1 hour. 4) Preheat oven to 375. Remove scones from freezer, re-cut, and arrange on baking sheet. Sprinkle generously with sugar, and bake for 20-25 minutes, until a tooth pick comes out clean. A tip I've found with scones (cream based, at least) - they always bake higher and fluffier when baked from frozen. When I bake mine straightaway after mixing, they always turn out rather flat and dense. A Unique Pumpkin Trifle. Yes. More Pumpkin! Apparently people aren't sick of new pumpkin recipes yet! Well this one is truly unique - in all my searching I've never found a recipe similar. It has a distinct pumpkin-ness while feeling light as a cloud and a little spicy at the same time. Even if you eat more than your pumpkin-y self should be forced to eat in one siting, it's so airy that you may not even notice. Observe: Angel Food cake stands in for Pound cake. Pumpkin Custard takes the place of Pudding. Even the whip cream has the added twist of pulverized candied ginger - which is a real treat! It all comes together to form a gloriously Autumnal-looking dessert. 2) Whisk together milk, pumpkin, cornstarch, corn syrup, ginger, and cinnamon in a large saucepan. Cook over medium heat until boiling and slightly thickened. 3) Whisk egg yolks with vanilla, and whisk into pumpkin mixture. Cook, stirring constantly, for 2 minutes, or until thick. It will thicken a bit more while it sits in the fridge, but make SURE it's still close to pudding texture at this point. Place a piece of waxed paper directly on the surface and chill for 2 - 4 hours, until completely cool. 4) Whip 1/2 cup of cream until soft peaks form - fold into cooled pumpkin. 5) Pulse sugar with ginger in a food processor until very few lumps remain. Whip remaining cream with ginger sugar until thick peaks form. 6) Layer 1/2 cake, 1/2 pumpkin, 1/2 cream. Repeat. 7) Chop up remaining ginger into small pieces and use to garnish. Refrigerate until serving! I used a toothpick to make swirly designs in the whip cream. I still can't decide whether I like it or not. If I said "the Holiday Season is now upon us" I probably wouldn't get a lot of argument these days. Yes, it's only the middle of November, but I think for most people it's close enough that the words Christmas Shopping cause sweaty palms and mental checklists to appear. You've probably already got your first get-together or party lined up in the cross-hairs, am I right? If you're feeling a bit of pressure in the next few weeks and cooking dinner is the absolute LAST thing on your mind, read on for an easy and filling dinner. A rushed version of Huevos Rancheros. If you're okay with eating eggs for dinner then by all means, give this a shot! You likely have all the ingredients in you cupboards anyway! Please excuse the poor picture quality. As I've said before, I don't think eggs photograph well so I didn't put in a lot of effort! Those are the bare minimum. See? Eggs are ugly, right? But boy are they delicious! 1) If you have some fresh tomatoes, onions, garlic, or peppers, dice those babies up and sautee them in some oil in the largest skillet you have! Set your grain of choice a-cooking while you finish up. 2) Add the can of tomatoes, and pour on as much salsa as your little heart desires. Give it a good stir and on medium-high heat, bring it to a simmer. 3) Once the mixture is good and hot, crack your eggs right in there! Reduce heat to medium-low, pop a lid on that bad-boy, and wait for your eggs to cook! You can season with salt, pepper, and/or paprika at this point if you want. If you want very cooked eggs, probably give it around 7-8 minutes. If you like a runny yolk, poke at them around the 4-5 minute mark (you'll want the whites to have JUST finished cooking). Top your rice/quinoa with this hearty concoction, and garnish with something green! November 1. Just like that, we're entering the official Holiday Season. Today, when you walk into stores and cafes, you just may hear some Christmas music in the rotation. The time of parties, feasting, visiting, and reflecting is here. I know in our generation Host/Hostess Gifts seem to be a bit old fashioned and have fallen by the wayside, but they're still very important. Have you ever been a host and received a small gift from one of your guests? It makes you feel so appreciated - so much more so then just having some compliment the meal you've prepared or thank you for inviting them. A lot of time, effort, and often cash goes into hosting an event or even a small dinner party. Yes, it's true, that person chose to spend all that time, effort, and money - but aren't you thankful they did? And you made the guest list! Even if it's a potluck you're invited to, the hostess still had to prepare their home for entertaining, and when you leave they'll have a lot of cleaning up and dishes to do. This year try bringing a small hostess gift to the first bash you're invited to, and just see if you don't get invited to the next one! Or get an extra large piece of dessert! You'll make someone's day - I promise. Food-gifts are, in my opinion, the easiest gift to make yourself. But around the Holiday's it's tricky - everyone is being bombarded left and right with unhealthy packages and treats! The key is to find something that can be kept on the shelf for a month or two, to be on hand and ready to go when the receiver finally feels like eating baking/candy/chocolate again. Dry mixes and canned goods are just the ticket in these cases. If you didn't happen to can any fruit this year and you don't have a favorite baking recipe, there's no shame in buying it. It's the thought that counts. But if you do want to get in on the DIY spirit, here's a little "tutorial" for you. Just be sure to attach instructions for the ingredients that need to be added, and how the item should be baked. Why don't you use my scone recipe? Only one ingredient needs to be added! - dry ingredients. For the scone recipe go here. - Mix all the dry ingredients and measure the final quantity so you know the size of jar you'll need. - Carefully spoon mix into jars. If you have some contrasting colors you could layer them. You may need to gently bang the jar down onto the counter once or twice to get the ingredients to settle so you can fill the jar fuller. - Top with a lid and cover with your cloth/muffin liner, and hold in place with an elastic or ribbon/string. - Write or type out the instructions and use tape or glue to stick to your jar! You can fancy up the package by adding other pieces of paper or more ribbons. A nice thing to do is pair two items. For example, I did Brown Sugar scones with Spiced Peach Jam. Another alternative is a Quick Bread and a Flavored Butter, or Dry Pasta and Spices with a jar of homemade Tomato Sauce. 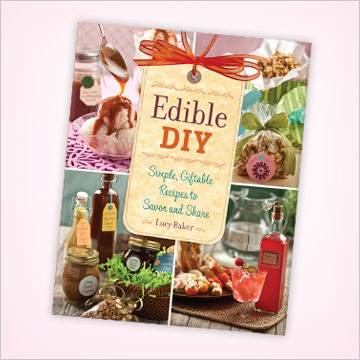 On my Christmas Wishlist this year is the book Edible DIY by Lucy Baker. It's full of wonderful ideas for just such things! I would LOVE to know if anyone out there has ever given a similar hostess gift, and what the reaction was that you got! Ideas for other DIY gifts would also be great. Use the Comments section to share your story! Candy. Nature's Candy, that is. Before: Shiny wedges of goodness! If possible wear gloves and an apron while chopping these babies - I should add "Natural Dye" to the list of things the beet does! There are a lot of foods out there that people are calling Nature's Candy. Like dates, grapes - any kind of fruit, really. But in my opinion, roasted beets are the sweetest natural candy there is! Raw they kind of taste like dirt. Or wood. Or cardboard, maybe. But when tossed in olive oil and roasted they become the sweetest, softest little jewels you've ever seen! Bonus, they're in season right now. They're also insanely good for you - a Super Food, if you will. They have zero fat, zero calories... they give you energy and have loads of vitamins... they've been known to guard against cancer and heart disease... and there are so many ways to cook them! Roasted though is the easiest I think, and a wonderful addition to any meal. Please try it. You'll be doing yourself a huge favor! No need to peel - just wash well and chop into chunks. Toss with olive oil, salt and pepper and roast at 425 for about an hour! After: Caramelized, soft and juicy. I call this Chocolate Slab because I just can't find another word to properly describe this dessert. It's technically a cake, but it's flourless so it's not fluffy at all. It could be considered a brownie, but it's not as dense and heavy as all that. I almost want to call it fudge except that it's too light, and not so sweet. It's a chilled, smooth, silky and creamy dream! 1) Oven to 375. Line the bottom of an 8-inch springform pan with parchment paper, then grease. 2) Gently melt the chocolate and butter in a bowl set over a saucepan of simmering water. When mostly melted, slowly stir in the coffee. Set aside to cool slightly. 2) In a mixer, whisk the eggs and sugar on medium-high until pale and doubled in volume. 3) Slowly stir in the melted chocolate mixture, and pour into your pan. 4) Bake 40 to 50 minutes, until the top is set and the cake feels firm. Cool, wrap it, and chill in the fridge for a few hours or overnight. The cake in the picture was topped with a thin layer of Dulce de Leche and Whip Cream - if you can handle 7 ingredients, go for it! A young wife and new mom, just trying to document those special moments before I blink.